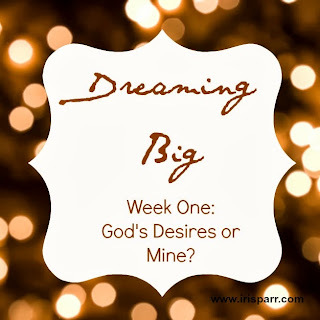 Dreaming BIG: God's desires or mine? Take delight in the Lord, and he will give you the desires of your heart. I remember a very pivotal moment in my life. It was the summer of 2007 and I had just come to the conclusion that this man I had been interested in was in fact not meant for me to spend the rest of my life with. It was disappointing, yet freeing. It was in that moment that I asked God to change my heart in regards to my desire to get married and have a family. I made a plan on how I would joyfully live my life as a single woman. How I would find success in my career and fill my life with family, friends, and travel. I filled out my application to begin my Masters Degree in Education. I felt a little sick doing this because truly that was not my heart’s desire. But, I had asked God to change my heart and so I needed to also do my part. In the next months it became very apparent that this was not God’s desire for me. He opened seemingly impossible doors and through God’s amazing ways, Jason and I met and began a long distance relationship. My initial heart’s desire had been from God. There was the perfect man for me to spend my life with out there. I will remove from them their heart of stone and give them a heart of flesh. He removes our hearts of stone and replaces them with hearts of flesh when we come to Him, repent of our sins and take up our cross and follow Him. It is at this moment that His Spirit enters our hearts and His desires become our desires. When we are one with Him we seek to do His will and we follow in obedience that can only bring joy. Only through God can we be certain that our desires are those that are from the heart of God. Let us, therefore, make every effort to enter that rest, so that no one will perish by following their example of disobedience. For the word of God is alive and active. Sharper than any double-edged sword, it penetrates even to dividing soul and spirit, joints and marrow; it judges the thoughts and attitudes of the heart. Nothing in all creation is hidden from God’s sight. Everything is uncovered and laid bare before the eyes of him to whom we must give account. The Word of God is alive and active; the best place to go to when seeking God’s will and knowing whether our heart’s desires are from Him is through relationship with Him. But how? The best way to communicate with God is through prayer and through reading His Word. Nothing is hidden from God and He will show us if only we spend time with Him. I would like you to be free from concern. An unmarried man is concerned about the Lord’s affairs—how he can please the Lord. But a married man is concerned about the affairs of this world—how he can please his wife— and his interests are divided. An unmarried woman or virgin is concerned about the Lord’s affairs: Her aim is to be devoted to the Lord in both body and spirit. But a married woman is concerned about the affairs of this world—how she can please her husband. I am saying this for your own good, not to restrict you, but that you may live in a right way in undivided devotion to the Lord. I took these words to heart and began to truly devote my time to the Lord and obsessed less about my desire to be married and start a family. I always disliked the cliché about finding your prince charming at the very moment that you stopped looking. Well, sadly (or perhaps not) that is exactly what happened to me and also to Jason, if you hear his side of our love story. It was when I started digging into the Word and truly spending time with God that things became glaringly apparent to me. Through His Word and spending time in prayer and giving it all over to Him, I got my ‘yes’, after accepting what I believed was a ‘no’. Dig into His Word. Spend time in prayer with your Father. Light a candle and see the flickering flame as His promise to be your light and guide you on the right path. He wants to commune with you. He wants you to grow and mature in Him and yes, He will show you His answer. In time.